The FLIR i5 thermal imaging infrared camera offers 100 x 100 pixels of infrared resolution with 2% accuracy and < 0.1°C at 25°C thermal sensitivity - a robust combination of capabilities to quickly detect electrical, mechanical, HVAC and energy-audit-related problems. One-handed operation is unsurpassed for quick and easy menu access and feature selection. It comes complete in a hard carrying transport case. 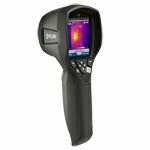 Flir i5 Compact Infrared Thermal Imaging Camera, 100 x 100 resolution.